Stella is a star! She is a lover of many things. She loves to run — she runs like the wind! She loves to cuddle and be near humans. She loves men, women, children and is fine around cats. She loves to play with her toys and other dogs. A variety of chew toys are a must. More than anything, Stella needs someone. Male or female, someone who she can trust will love her and spend a lot of time with her. Stella has a lot of energy and is physically strong. Daily exercise and a place to run make her very happy. She is intelligent and consistency helps her to continue learning manners. 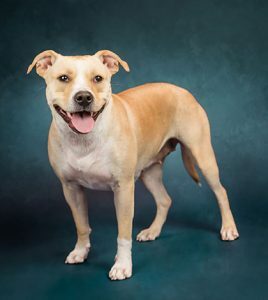 If you are looking for a friendly and lovable dog, Stella is your girl! Stella is currently living in a foster home. For more information or to meet her, please fill out an online adoption application or call Helping Strays at 618-939-7389.